This compact system features disposable inline filters. The prefilter is a five-micron carbon block and the postfilter is a granular coconut shell carbon. It's very easy to use, easy to service. 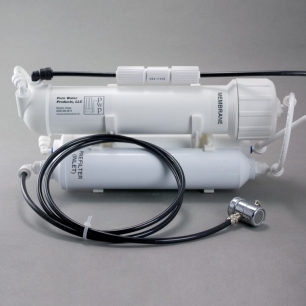 Water enters a carbon block filter, passes through the reverse osmosis membrane (top vessel), and exits through a granular carbon filter. The cartridges are from top makers — Pentek and Omnipure.